I don’t know about you but with the craziness of new spring soccer schedules (three separate teams this year + one kid opting to wrestle instead of soccer), trying to get a meal ready at the right time in between running kids to practices and Cub Scouts and whatever else the evening holds (not including just keeping the house together, homework done, and piano practiced) is a little chaotic. Enter the 30-minute skillet meal. I have professed my love for one-pot/one-skillet meals over the years. They are my lifesaver. Fast, easy, and healthy, they often prove to be the perfect solution to weeknight dinner craziness. 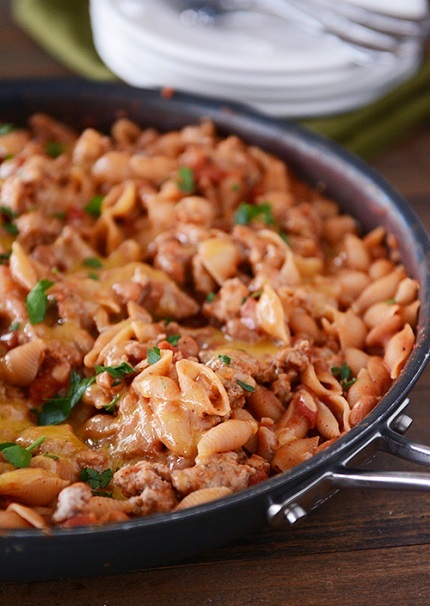 Today’s version — a loaded skillet full of saucy, tender pasta shells and warm, taco-style flavors — is fantastic. Sure, it may look like slop on the plate, but in my family, at least, the ravenous kids (and let’s be honest, me, too) don’t care a bit how it looks, especially when the whole concoction is smothered in cheese, sour cream, salsa and olives. Seconds, please. I’ve made this a couple of times and the last go-round, I made it in my only available 30-minute window around 4:45 knowing we wouldn’t be eating until probably 6:30. After it was finished cooking, complete with a healthy smattering of cheese, I covered the whole skillet in greased foil, popped it in a warm oven (about 170 degrees) and we devoured it a couple hours later. Granted, the pasta wasn’t quite as saucy as if we had eaten it right away but no one was complaining, that’s for sure. And it meant we were able to eat a hearty, delicious meal as a family. If only it was that simple and smooth and stress-free every night! Hey, I’ll take it when I can get it. In a large, 12-inch nonstick skillet over medium heat, cook the ground turkey or beef, salt, pepper, onion (or onion powder), and garlic (or garlic powder), stirring every once in a while to break the meat into small pieces. Once the meat is cooked through, drain any excess grease and scrape the meat mixture to a paper towel-lined plate. 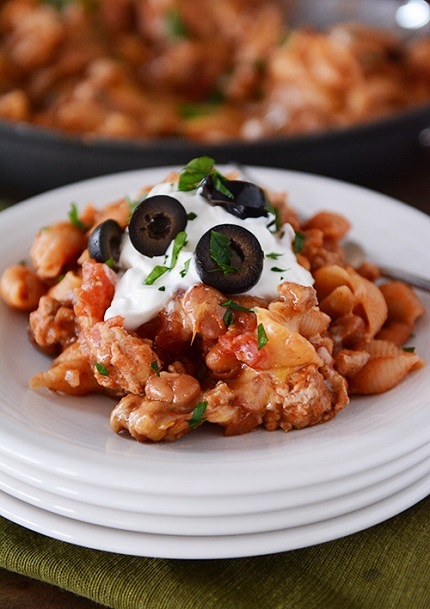 To the skillet add the diced tomatoes, tomato sauce, salsa verde, pinto beans, chili powder, oregano, pasta shells, chicken broth, Worcestershire sauce and brown sugar. 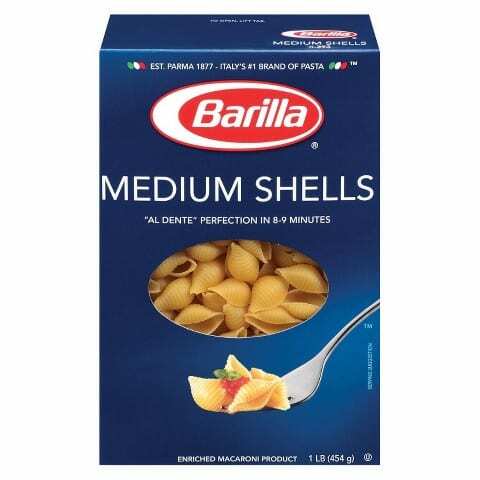 Bring the mixture to a gentle simmer and cook, stirring often to make sure the pasta isn't sticking, until the pasta is tender and most of the liquid has been absorbed, 15-20 minutes. Stir in the cooked ground meat and top with the shredded cheese. Cover the skillet for 1-2 minutes to let the cheese melt. Sprinkle with fresh cilantro. The pasta will thicken as it rests. Serve with sour cream, olives, and salsa, if desired. Recipe Source: sent to me by my cousin-in-law, Julianne, who made the recipe and raved. I adapted it from the original source here.